Bhí Seachtain ghníomhach scoile ag Gaelscoil Chluain Dolcáin don chéad uair i mí an Mheithimh 2012. Bhain páistí, múinteoirí agus tuismitheoirí na scoile an-taitneamh as an seachtain. 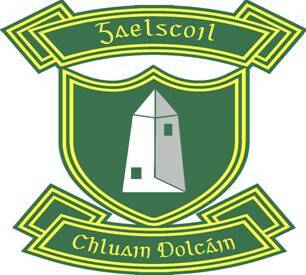 Gaelscoil Chluain Dolcáin held their Active School Week for the first time in June 2012. Teachers, parents and the children of the school had great fun! Bhí ar gach rang sa scoil tír amháin, a bhí ag glacadh páirt sa chomórtas sacair Euro 2012, a roghnú agus tionscnamh/taispeántas a dhéanamh faoin tír sin. Bhí lá Spóirt iontach againn ar an Déardaoin. Cé go raibh sé dorcha agus baol báistí ann, bhaineamar sult as na himeachtaí éagsúla a bhí ar fáil dúinn. Bhí sraithchomórtas sacair ar siúl ag na buachaillí agus ag na cailíní ó na hardranganna ag am sosa agus am loin i rith an triú téarma. Imríodh an cluiche ceannais ar an Aoine i rith na seachtaine gníomhaí scoile. Every class had to pick a country competing in Euro 2012 and compete a presentation/project on their chosen country. We had a great Sports Day on Thursday. Even though it was dark and looked like it would rain, we enjoyed all of the activities. During the third term, the boys and girls in the senior classes took part in a soccer league. The final of this league was played on the Friday of the active school week.